A special unit of the Portuguese Judiciary Police from Oporto are reviewing the Madeleine McCann case performed by the initial teams from Algarve and Lisbon, they are working in partnership with United Kingdom's Scotland Yard who are also making a parallel review of the whole Portuguese investigation, of the English authorities case files who worked in cooperation with the Portuguese Police, and of the work of the private detectives hired by the McCann couple. However, the said reviews have not, so far, lead to sufficient evidence nor to new leads that could force the reopening of the process that was archived by the Portuguese Public Ministry back in July 2008. It is important for the Portuguese institutions and people targeted in this petition to know that, we, the public and tax payers from both the UK and Portugal, demand that the costs of those reviews bear fruit, and that only the reopening of the process, and thus of the investigation is considered as a successful outcome. 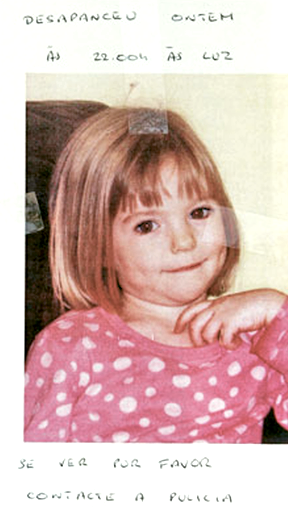 On the 3rd of May, 2007, in Praia da Luz, Lagos, Portugal, a little English girl, then aged almost four, disappeared! Until now, three and a half years later, we still do not know what really happened. The two main theories for the event are well known: abduction, which is the explanation that was offered by the child’s parents, and an accidental death, with the simulation of an abduction and concealment of the body, which is the thesis that is defended by Dr. Gonçalo Amaral, the Judiciary Police investigator who coordinated the investigation process until the 2nd of October, 2007. Over these three and a half years, many things happened and many lines of text were written. From the creation of a Support Fund for Madeleine Beth McCann’s parents, to the banning of the book “The Truth of the Lie”, written by Gonçalo Amaral, many events have been concealing the Truth about this case. On October 19, 2010, the Lisbon Appeals Court lifted the injunction over the book “The Truth of the Lie”. The authors of the injunction had a time period to file an extraordinary appeal, which ended on the 3rd of November. Nevertheless, instead of filing an appeal, Madeleine Beth McCann’s parents launched a petition with the purpose to force the Portuguese and English authorities to review some information that is part of the process, which they believe has not been duly investigated. They could have asked for the process to be reopened, but they failed to do so! Criminal investigation must be unbiased and free, which is not compatible with the pressures that some try to exercise. Therefore, to centre the investigation on “some information” will condition both its direction and its contents. Presuming that both main theories for what happened on the 3rd of May of 2007 are legitimate, it does not seem honest to condition the course of the investigation from the outset. From that perspective, only the REOPENING of the process can offer the guarantee of equality for BOTH theories. And more! It can open up new perspectives over the case! Little has been said about Maddie. A lot has been said about the adults that are involved in the process. It is time to pay attention to Maddie! Therefore, if you agree that only the REOPENING of the process will allow for the investigation to carry on without being conditioned, under any theory whatsoever, and that only a free investigation will do Maddie Justice, do sign this petition, which, upon reaching 5000 signatures, will be delivered to the Attorney General’s Office, to the Parliament, to the Government and to the President’s Office! Note: Each time someone signs the petition, a message in Portuguese will be forwarded to the Portuguese authorities and politicians mentioned on the petition. Take Action: make your voice heard by those who matter. For Madeleine! Em 3 de Maio, de 2007, na Praia da Luz, Lagos, Portugal, uma menina inglesa, então com quase 4 anos, desapareceu! Até à data, passados três anos e meio, continuamos sem saber o que realmente, aconteceu. As duas principais teorias para o acontecimento são bem conhecidas: o rapto, explicação dada pelos pais da menor, e a morte acidental, com simulação de rapto com ocultação de cadáver, tese defendida pelo Dr. Gonçalo Amaral, investigador da Polícia Judiciária que coordenou o processo de investigação até dia 2 de Outubro de 2007. Durante estes três anos e meio muitas coisas aconteceram e muitas linhas foram escritas. Da criação de um Fundo de Apoio aos Pais de Madeleine Beth McCann, à proibição da venda do Livro “A Verdade da Mentira”, da autoria de Gonçalo Amaral, muitos foram os acontecimentos que têm escondido a Verdade sobre este caso. No passado dia 19 de Outubro, o Tribunal da Relação de Lisboa levantou a providência cautelar ao Livro “A Verdade da Mentira”. Os autores da Providência Cautelar teriam um prazo para efectuar um recurso extraordinário que terminou no passado dia 3 de Novembro. Contudo, ao invés de recorrerem, os Pais de Madeleine Beth McCann lançaram uma petição com o objectivo de forçar as autoridades portuguesas e inglesas a reanalisarem algumas informações constantes no processo que, no seu entender, não foram devidamente investigadas. Podiam ter pedido a reabertura do processo, mas não o fizeram! A investigação criminal tem de ser isenta e livre, o que é incompatível com as pressões que alguns tentam exercer. Assim sendo, centrar a investigação em “algumas informações” vai condicionar quer o seu rumo quer o seu conteúdo. Partindo do pressuposto da legitimidade das duas principais teorias para o que se passou no dia 3 de Maio de 2007, não parece honesto condicionar, à partida o rumo da investigação. Nesta perspectiva, só a REABERTURA do processo pode oferecer garantias de igualdade a AMBAS as teorias. Mas, mais! Pode fazer emergir novas perspectivas sobre o caso!!! Pouco se tem falado de Maddie. Muito se tem falado dos adultos implicados no processo. Está na hora de dar atenção a Maddie! Por isso mesmo, se estiver de acordo com a ideia de que só a REABERTURA do processo permitirá que a investigação continue sem condicionamentos, seja de que teoria for, e que só uma investigação livre poderá ser Justa para a pequena Maddie, assine esta petição que, ao chegar às 5000 assinaturas, será entregue à Procuradoria-Geral da República, à Assembleia da República, ao Governo e à Presidência!